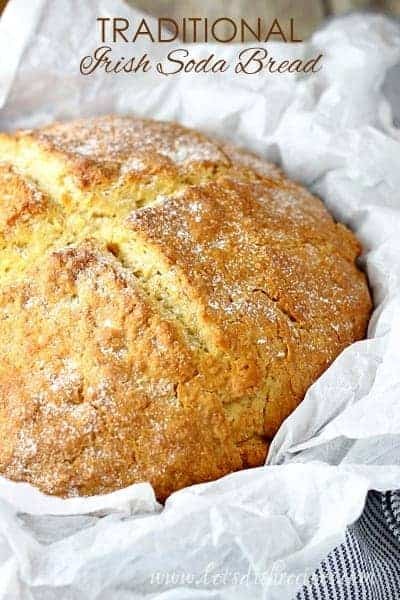 NO-KNEAD HONEY OAT BREAD — This easy yeast bread is sweetened with honey and loaded with oats. Which makes this no-knead honey oat bread perfect for toast, sandwiches and snacking. 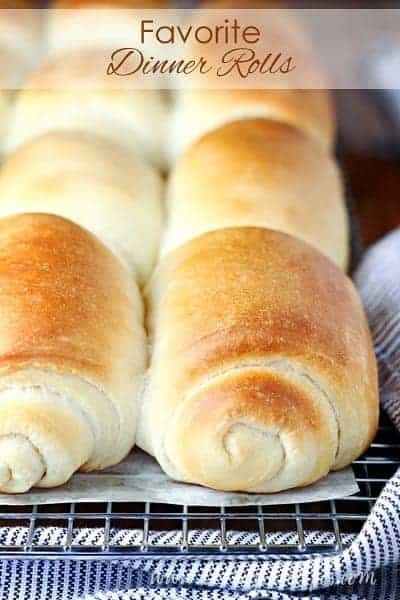 You may have noticed that I don’t share a lot of homemade yeast bread recipes here. The truth is, I’m lazy. I don’t want to bother with all that kneading and waiting when I can buy a lovely loaf of bread from the grocery store. 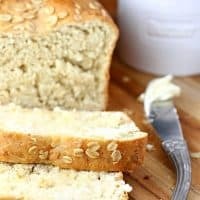 But this No-Knead Honey Oat Bread has me rethinking all of that! This bread was done, from putting the bag of flour on the counter to bread out of the oven, in 2 hours. It is delicious and so easy. Thanks for the wonderful recipe. First of all, there’s no kneading! So we’ve already omitted one of the things I’m impatient about. You do still have to wait for the bread to rise, but only for about 35 minutes. I can handle that! And even if I had to wait longer, it would be worth it, because this bread is absolutely wonderful. It’s got a hint of sweetness from the honey, which makes it delightful with some jam for breakfast. But it’s not so sweet that you can’t slice it up and use it for sandwiches. Best of all, it’s so easy, and practically foolproof! I honestly wasn’t sure what to expect the first time I tried this bread, but I was so pleased with how it turned out. It’s soft, butter and just a little bit sweet. My favorite way to enjoy it is warm from the oven, slathered with melted butter. 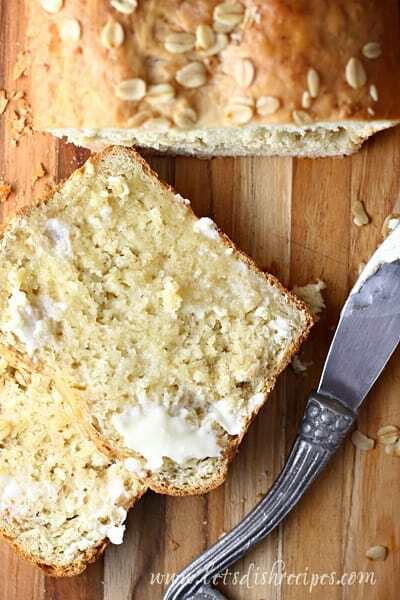 I love that this bread is so versatile, and works well for breakfast, lunch or dinner. Just be sure to use rolled oats in this recipe, not the quick cooking kind. I like to sprinkle some oats over the bread before cooking too, for appearances, but that’s totally optional. Either way, you’re going to love this sweet, simple yeast bread. Happy baking! 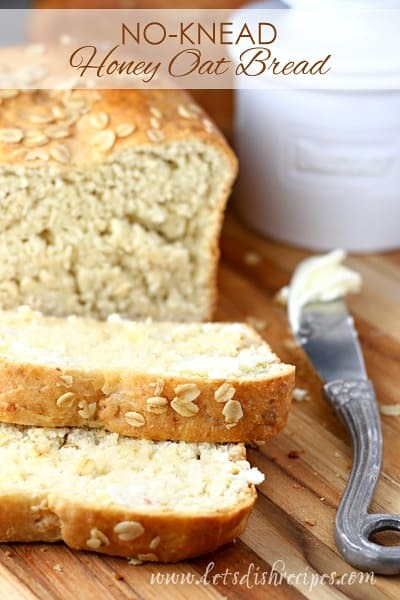 Be sure to save this No-Knead Honey Oat Bread recipe to your favorite Pinterest board for later. In a small saucepan, heat 1 cup water to boiling. Stir in the oats, butter, honey and salt. Let stand until mixture cools to 110°-115°, stirring occasionally. Heat remaining water in microwave to 110°-115°. In a large bowl, dissolve the yeast in the remaining warm water. Add the egg, oat/honey mixture and 2 cups flour. Mix until smooth. Gradually stir in remaining 2-3 cups flour until a stiff dough forms. Spread batter evenly into two greased 9x5 inch loaf pans. Smooth tops of loaves. Cover and let rise in a warm place until doubled in size, about 35-40 minutes. Bake at 375 degrees for 40-45 minutes; brush with melted butter, if desired. Remove from pans to wire racks to cool completely. Do you know how long the bread will last? I’m looking to make 8-10 loaves as gifts but will be giving out over a few days. This bread looks soft enough (vs a french loaf or similar) that I think it would work. Would you agree? That should be fine. We’ve eaten over the course of several days and it was still soft. I think it would be even more so since you wouldn’t be cutting into it. I was suspicious about the rise time because other no-knead breads take about 12 hours and yeast usually likes 2-3 hours. This bread was done, from putting the bag of flour on the counter to bread out of the oven, in 2 hours. It is delicious and so easy. To make it even easier and less cleanup, I tried a couple of things that worked well for a non-beginner cook (easier with an instant-read thermometer but not necessary): 1. Proof your yeast in the big bowl with warm water as noted, but add a cup of flour and the honey to feed the yeast while you’re making the oat mixture. I used 3 packets of 1/4 oz yeast each and that was plenty. If the yeast is foaming after a few minutes, it’s healthy and ready to work for you. 2. Heat hot water for the oat mixture in a medium bowl in the microwave until boiling. Add the oatmeal to the bowl, stir and let sit a couple of minutes (this is when I made the yeast mixture). Put in the butter (mine was frozen and in chunks, no softening needed) and stir until melted. Add the other ingredients and check the temperature. You can get the oatmeal down to 115 with the butter (or stir in the eggs etc. until it’s cool enough to mix with your yeast—but make sure the mix isn’t so hot it cooks the eggs). Remember that a cup of flour and the honey is already in with the yeast. Stir the oat mix into the yeast bowl and add the other ingredients, finishing with the flour. Follow the rest of the recipe directions. This saves a saucepan and makes the assembly quicker. Thanks for the wonderful recipe. This recipe is so easy to make. It’s delicious toasted or for making sandwiches. Do you use quick oats for this recipe? No, the recipe calls for rolled oats, which are not the quick oats. I only had quick oats I hope it works. Yes you can freeze a loaf. This is my new favorite bread..ever! 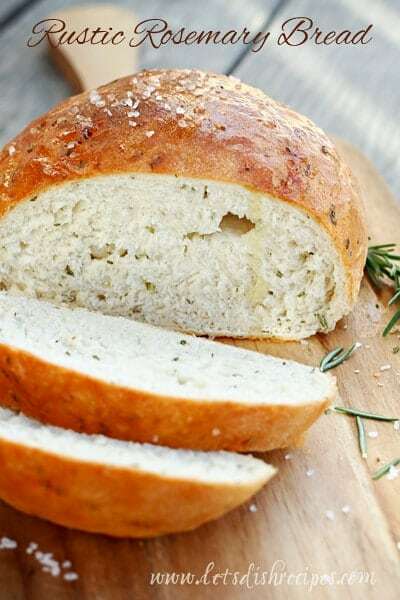 It beats out store-bought or even bakery bread! My boyfriend had some just last night and was the most impressed he’s ever been with anything I’ve cooked. Thank you for the perfect recipe— no adjustments necessary! Followed it to the letter, for great success. Can I use half whole wheat flour and half AP? Sure! I’d love to hear how it turns out. Would it be possible to use finely ground unicorn wheat in place of white or bread flour? If so should I make any adjustments?